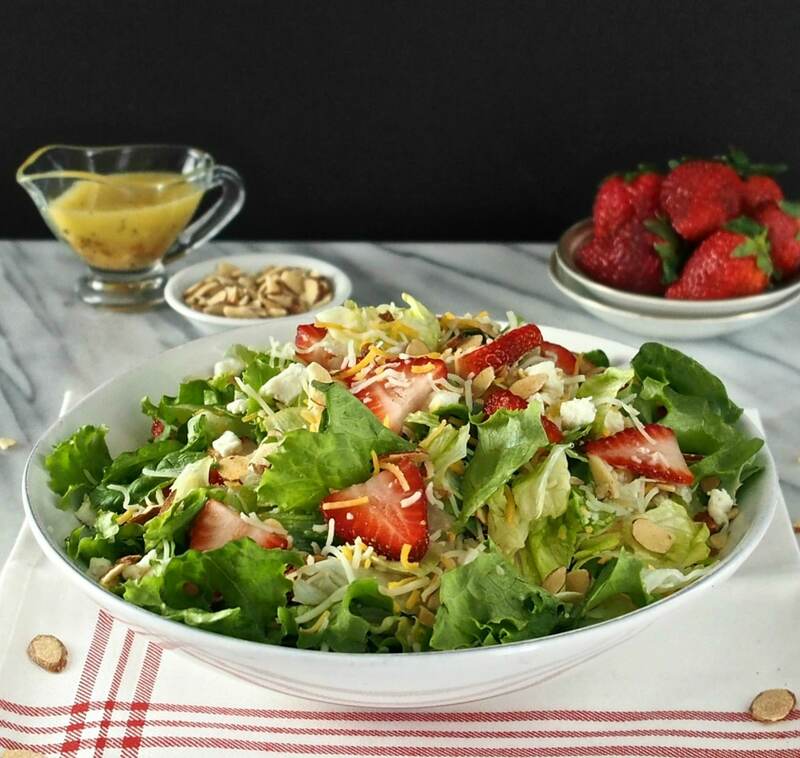 Strawberries & Greens Salad with Poppyseed Sweet & Sour Dressing is a stunning example of how opposites can work beautifully together. When looking at this salad, the first thing that catches the eye is color. It is bursting with shades of reds and greens – two complementary colors on the color wheel. The conversations that happen at the color wheel must be hilarious, and I imagine one of them might go like this. Green talking to Red, “Hey! Hey you, Red! Yes, you, you beautiful thing! You are one gorgeous hue. You are the color of roses, cherries, lips, rubies, holly berries, autumn leaves, and sometimes the sky at night. Red responding to Green, “Oh, you do make me blush, sir. You aren’t so bad yourself, you hunky hunk! You are the color of leaves, pistachios, emeralds, limes, peacock feathers and the grassy blanket covering Ireland. I don’t know about you, but maybe we should leave those two alone so they can get to know each other in private. Thankfully, the “opposites attract” thing isn’t all about color – it is also about texture and taste. 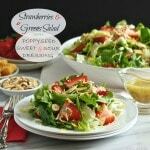 Strawberries & Greens Salad has sweet, smooth strawberries; crunchy toasted almonds; creamy tart goat cheese plus tangy, smooth cheddar. Then it is topped with crunchy, salty croutons. Oh. My. Gosh! Are you still standing? Now, add a drizzle of Sweet & Sour Poppyseed Dressing just to make you swoon. 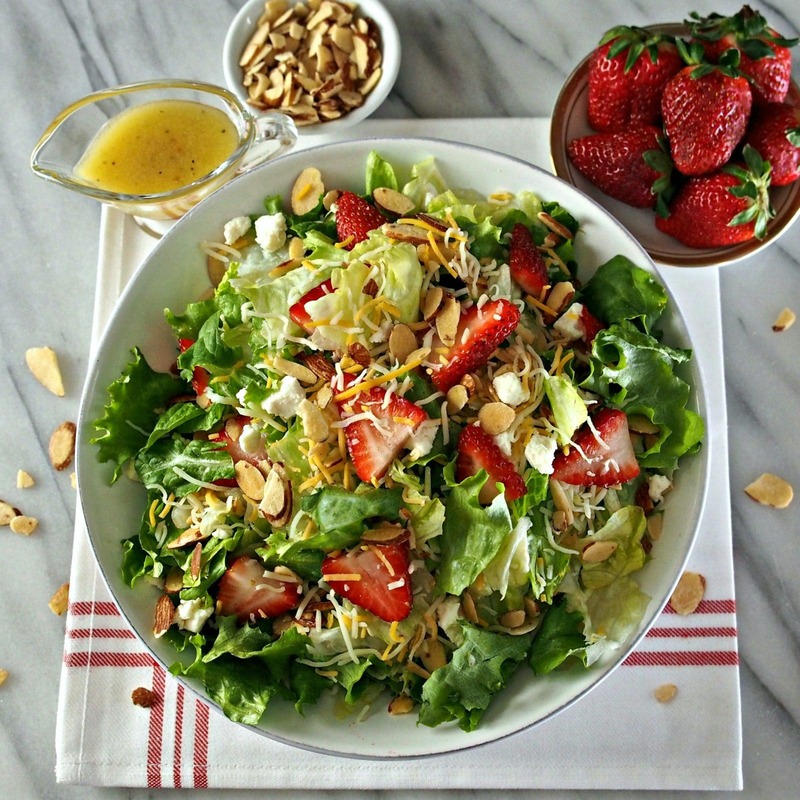 I’m serious, you should not be standing while eating Strawberries & Greens Salad with Poppyseed Sweet & Sour Dressing – people have been known to faint. 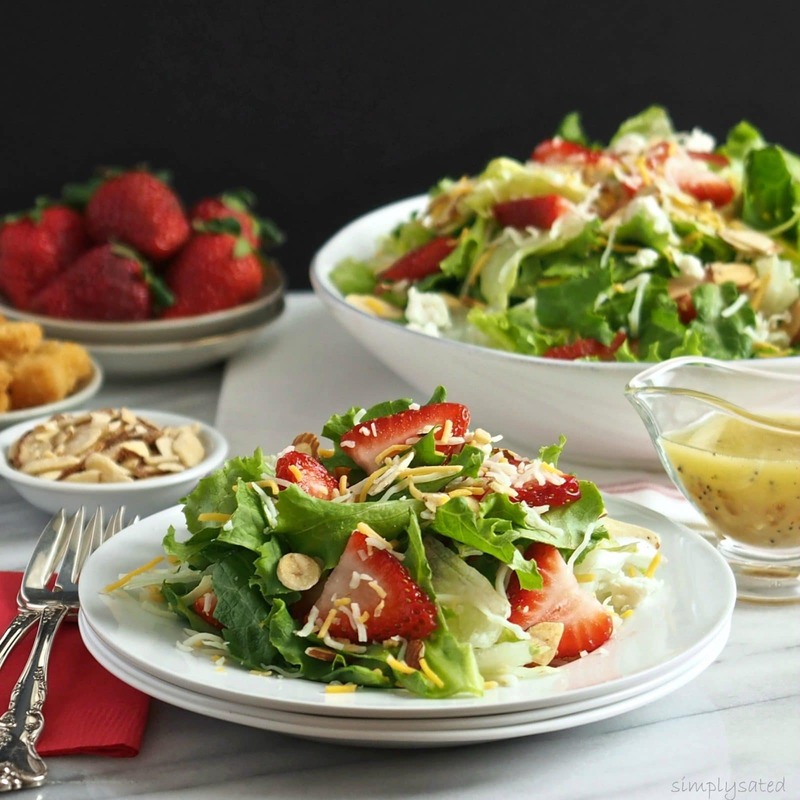 So, come on, sit down and make your very own Strawberries & Greens Salad aka, “Opposites Attract Salad.” It is just too darned delicious not too. I highly recommend this other oh-so-simple and shining example of opposite-type foods working well together. It also happens to be one of my favorites. Pineapple with Lime Zest. 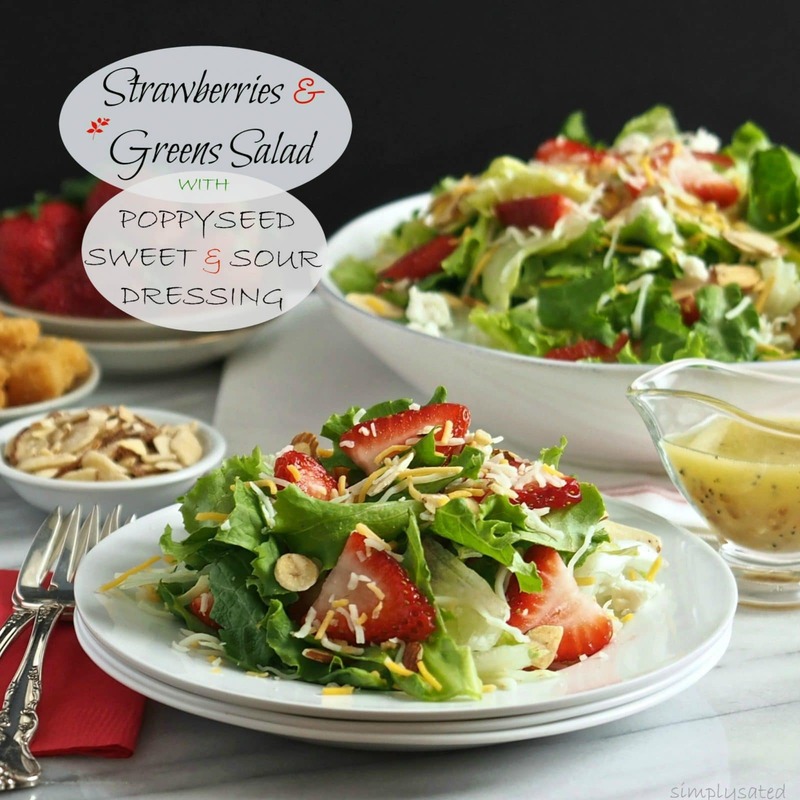 Strawberries, greens, sugared almonds, cheese with poppy seed dressing & croutons. Combine all salad ingredients except croutons. Toss and mix gently. Combine all dressing ingredients except the oil and poppyseeds in a blender or food processor. Mix on HIGH until well incorporated - 1 minute. Slowly, and with the blender on HIGH, slowly add the oil and mix the dressing until the oil is incorporated, 1-2 minutes. Add poppyseeds and mix another 30 seconds. I love poppyseed dressing but have never tried making my own! I can't wait to try this recipe! You will love this recipe and it tastes even better the next day. It is delicious and easy. Thanks so much for stopping by today. 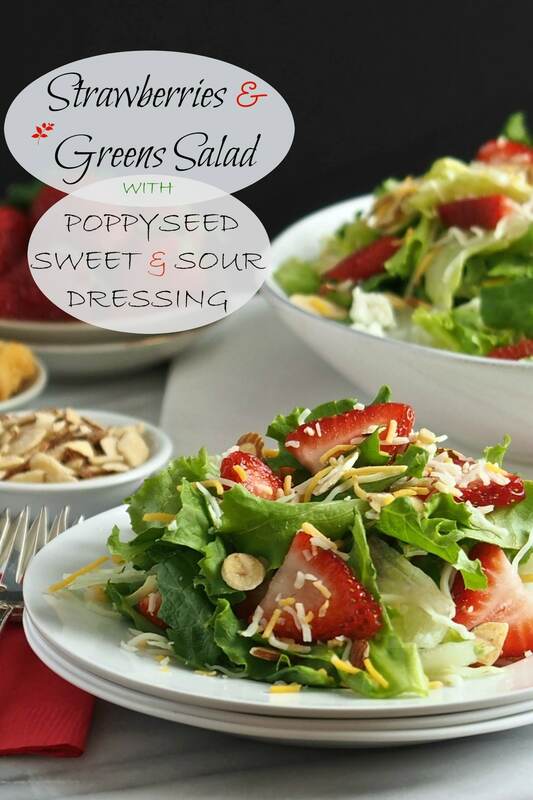 Strawberries and poppyseed dressing on greens is one of my favorite ways to make salads!! Great recipe!! What a lovely, fresh looking salad. Thank you for including the recipe for Poppyseed Dressing, I've never made it before and I'd love to try it. Thank you, Joanie. It is a delicious salad dressing and very easy. It tastes even better after the flavors meld. Thanks for coming by today. Fantastically gorgeous, light, healthy and DELICIOUS! So nicely done, again! Thank you, Dan, and thanks again for taking the time to comment. This salad is really beautiful, Susie! 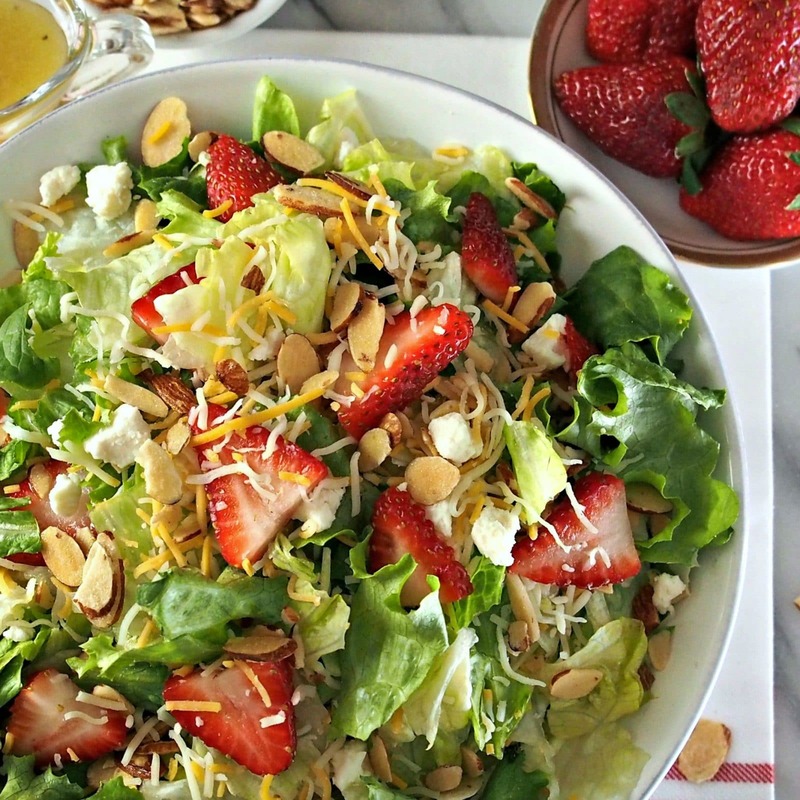 I love the bright color given by the strawberries and that poppyseed dressing sounds gorgeous! Thank you, Nicole. This is one of my favorites salads and the dressing is crazy good. Thanks for stopping by today!! Susie, you have put together a beautiful salad with such lovely presentation. It looks really yummy! Thanks so much, Linda. Your comments are so sweet. This looks amazing! Perfectly fresh and pretty for the winter season. Can't wait to try your dressing! My husband and I just recently had a salad like this. Pinning to share with others! Thanks so much, Jenny, and thanks for stopping by. This is beautiful mom! One of my favorite salads that you make. Love! Thanks, Bec. Yep, it has been a long time family favorite. Oh baby! This looks amazing! 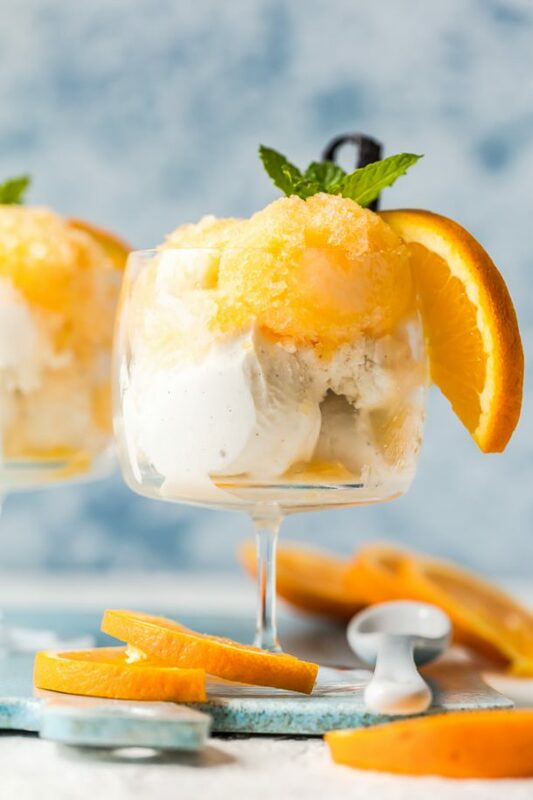 Another recipe I have to try..THANKS! 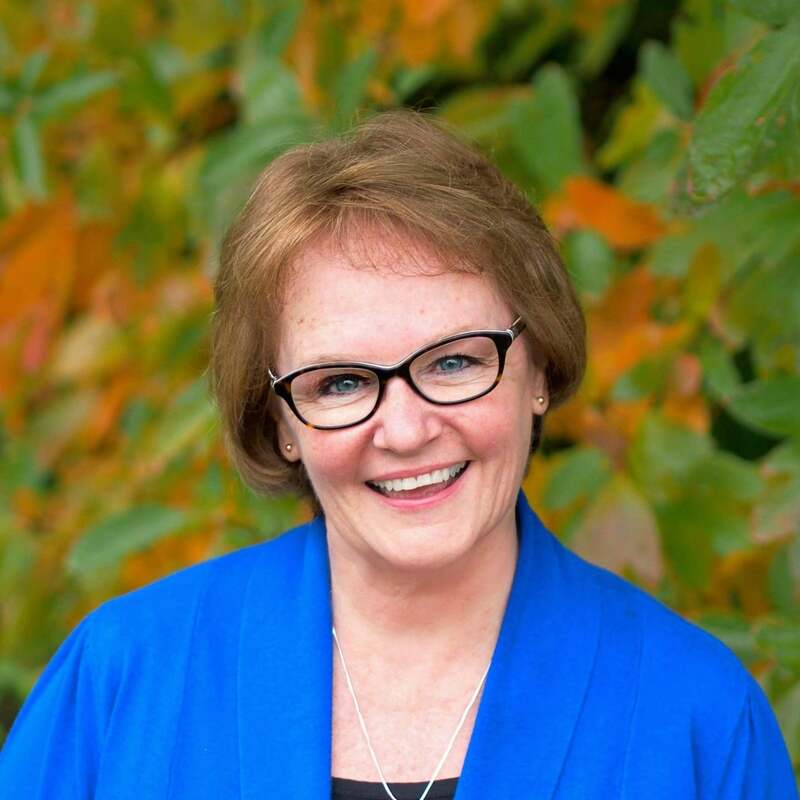 Thanks so much, Kathy. This is an all-time favorite and I know you will love it. Thanks for taking the time to stop by today. I love the flavors of this salad and the dressing sounds divine! Thank you, Connie, and you are correct - the dressing is divine. It also keeps nicely in the fridge for a month:-) Thanks so much for stopping by Simply Sated.